A good opportunity to kick off the holiday season arrives this Sunday, Nov. 17, as the Wasatch Cooperative Market hosts a pie-baking contest and membership-owner campaign drive. --- The Wasatch Cooperative Market is a full-service, socially and environmentally responsible grocery store focused on selling local, high-quality products at fair-trade prices. Join me and others from 3 to 5 p.m. on Sunday for a free pie-baking contest at the Salt Lake Culinary Center (2233 S. 300 East). 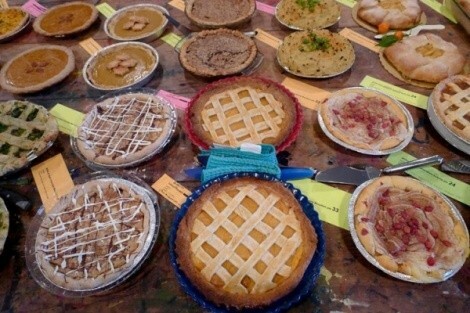 You can bring a pie to enter into the contest, or just bring your appetite and enthusiasm and help pick winners in multiple pie-baking categories. I'll be joined by food expert Vanessa Chang; KUER's Doug Fabrizio, host of Radio West; Log Haven's Faith Sweeten; and Catalyst publisher Greta Belanger deJong as judges. In addition, Mollie Snider, chef at the Salt Lake Culinary Center, will present a demonstration on the art of pie making. The pie-baking contest is also an opportunity to join the Wasatch Cooperative Market, and everyone who signs up as a member-owner at the free event will receive a Co-op T-shirt or tote bag. The pie-baking contest is free, but we invite you to bring nonperishable food donations for the Utah Food Bank. To view the WCM's Facebook pie contest page, click here.